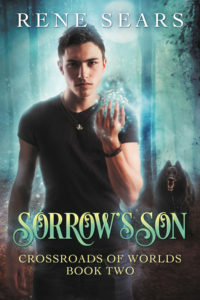 Quick post to note that Sorrow’s Son is coming out Sept. 15th, and is available for preorder here. Whew! Very excited to have the release date set. You can read more about the book and read an excerpt here. Also, beginning Sept. 8th, I’ll have a Goodreads giveaway for Strangehold, followed a few later with one for Sorrow’s Son, signed paper copies for both. I’ll link to those when they go live. Right now, I’m in edits for “Fire on the Hill”, a 15,000ish word story about Morgan and Matthew in the 1990s, well before the events of Strangehold. It should go out exclusively to newsletter subscribers by the end of the month. After that, I’ll be getting back into the first draft of book three, Queen of Storms. If the writing goes according to schedule, it should see release by the end of the year. This entry was posted in Uncategorized and tagged Crossroads of Worlds, Sorrow's Son, writing update. Bookmark the permalink.